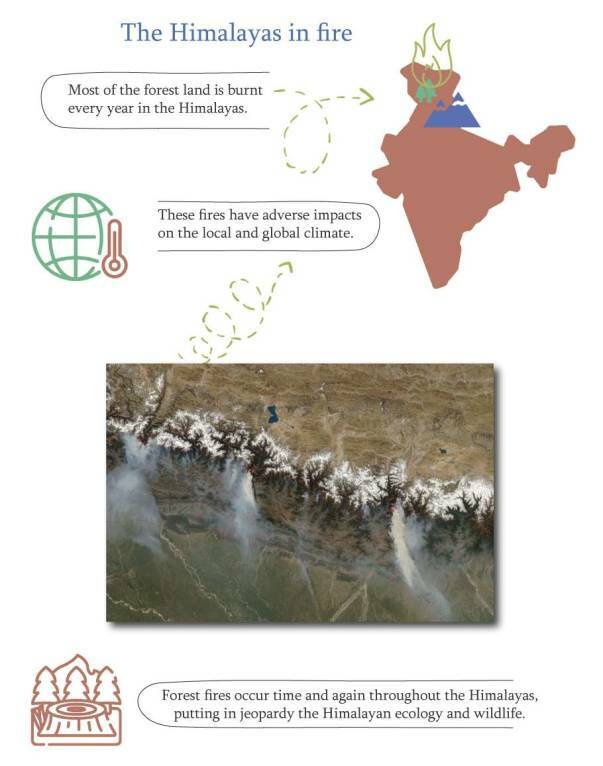 Most of the forest lands are burnt every year in the Himalayas. The Himalayas shelter unique ecosystems and is home to many endangered species. This is seriously threatened by widespread forest fires. The Himalayas have a major role to play in the regulation of the global climate. 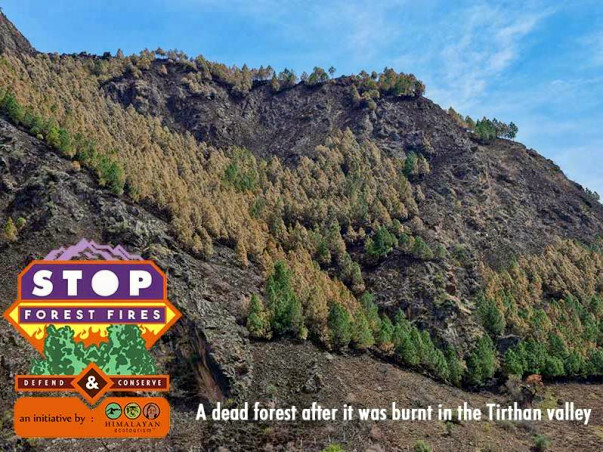 Hence the phenomenon of forest fires has numerous adverse impacts on the local and global climate. The large majority of these fires are intentional. There are initiated by the local villagers who get some immediate short-term benefits in an easy way. Unfortunately, they are not aware of (or prefer not to know about) the irreversible long-term adverse consequences. Himalayan Ecotourism is a social enterprise located in the Kullu district. 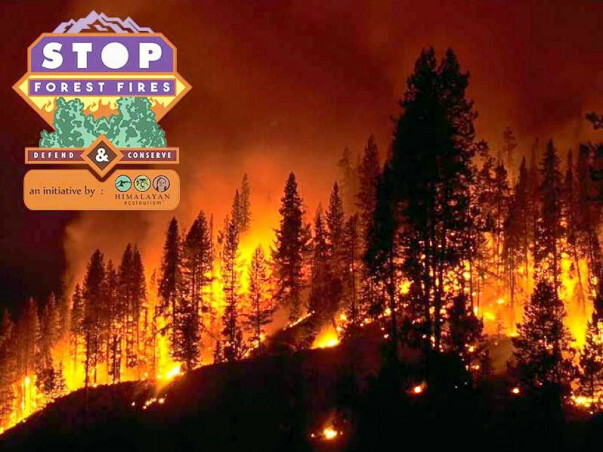 We have decided to do something about these forest fires. 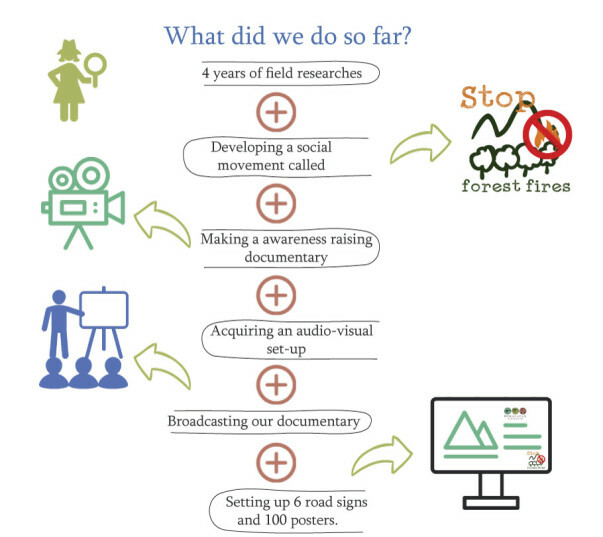 For the last four years we are conducting researches to understand how we could act in an efficient way. We have realized that raising awareness and, somehow, forcing the villagers to think and discuss the matter is a crucial step. We think that, eventually, this should create a bolder social pressure on the people who light these fires, and so, they may end doing this. What we did so far ? Our previous crowdfunding helped us to acquire an Audio-Visual set-up which enabled us to broadcast our documentary ‘To Wake-Buddhi” in the villages and in local schools. Thanks to all the contributors we could also set up 6 road signs and 100 posters in strategic places in the Tirthan Valley, near the Great Himalayan National Park. The local villagers response was very encouraging. They like very much our initiative and that tells us that we are on the right track! Cant's wait for the next step ! 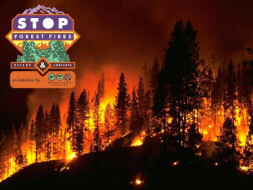 We feel that a continuous effort of awareness raising could trigger a strong social movement against the forest fires. Many villagers have already shown us that they would happily pass on the message in their village, and hence, they become the pioneers of conservation of the Himalayas. 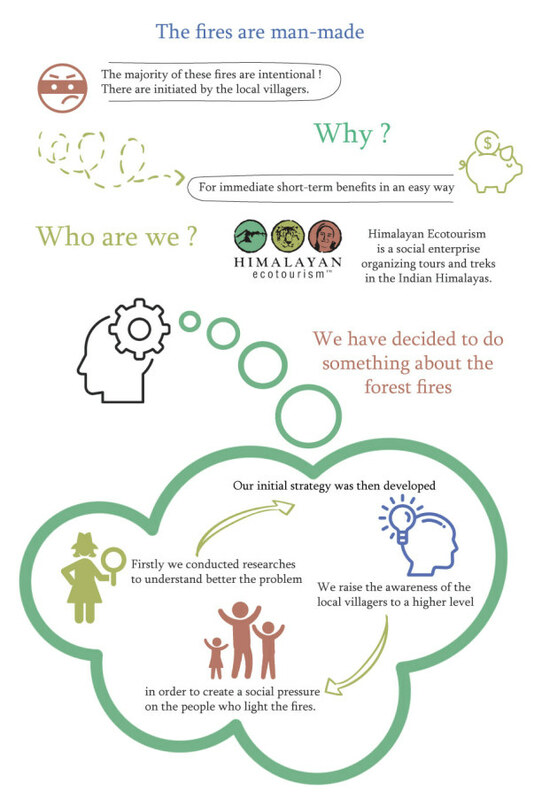 We will encourage these people by creating the “I am a defender of the Himalayan forests” movement. We hope many locals will identify with the movement. As we are a social enterprise with limited funds, we need your help to achieve our goal. - To set up 10 more road signs (cost for one road sign : manufacturing Rs 3100, transport Rs 500, stand and frame : Rs 600, setup of the frame in concrete base : Rs 800) and 200 posters (manufacturing and transport Rs 50 each). This is a very efficient way to forcefully bring the matter on the table of the villagers – Rs 60,000 (around 750€ and 900$). 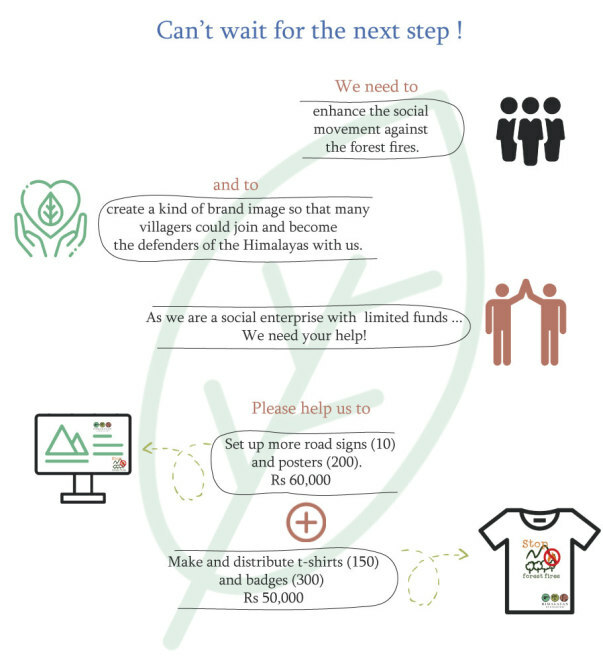 - To make 150 “I am a defender of the Himalayan forests” t-shirts (Rs 230 for one t-shirt) and 310 badges (Rs 50 each) - Rs 50,000 (around 630€ and 770$). So the total budget of this very important campaign is 1,10,000 Rs (around 1380€ and 1670$). Thank a million for your support ! More posters placed, meetings in the villages, preparation of local team to intervene in the school with presentation, beautiful pamphlets, and ... a satirical song in Hindi is taking shape ! You can see our new video and share it because we do need more funds to continue !! !